The words Jew and Judea (as the land was known) were both derived from Judah, one of the twelve sons of Jacob the Patriarch (whose name was changed to Israel 3,500 years ago). Judah is included in the Messianic line and can be found in Genesis 49:10-11. After leaving Egypt, the Jewish people entered into the land that God had promised them. They lived in this land until 70 CE, when the Romans destroyed the Second Temple and drove them from the land. However, there has never been a time when a remnant of the Jewish people did not live in the land. Israel is the only democracy in the Middle East and all of its Arab citizens enjoy all of the rights of full citizenship. Israel is the source of many inventions that have benefited the entire world: the USB flash drive; Instant Messaging; the laser keyboard; rooftop solar hot water systems; the Pillcam, used to visualize and detect disorders of the GI tract; drip irrigation; cherry tomatoes; the electric car grid; the world’s smallest video camera, which fits in an endoscope; ReWalk, robotic exoskeleton for paraplegics; the Sambucol flu treatment; Copaxone for multiple sclerosis; EndoPat, fingertip test for cardiac health; WatchPat, miniature fingertip sleep lab; Nanowires, strands of silver 1,000 times thinner than a human hair, Babysense, a no-touch, no-radiation device to prevent crib death; and more. 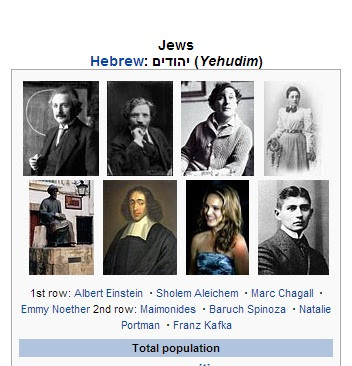 Today, many leaders in the most successful segments of commerce, entertainment, hospitality, math, medicine, music, retail, sports, and technology are Jews. Jewish entrepreneurs founded Costco, Dell Computer, Google, Facebook, the Four Seasons, Intel, Oracle, DreamWorks, Microsoft, MGM , and Wynn Resorts. Jews were in the forefront of the garment industry with companies like Calvin Klein, Donna Karan, Levi Strauss, and Ralph Lauren. Bloomingdale’s, Macy’s, the May Company, Neiman Marcus, and Saks Fifth Avenue were all launched by Jews; as were Baskin Robbins, the Gap stores (Old Navy, Banana Republic, Piperlime, Athleta), Häagen-Dazs, and Home Depot. The canon of the Hebrew Bible is known as the Tanakh, or Masoretic Text, in which every word and every letter of the Hebrew and Aramaic writings were carefully counted and noted so that correct and authentic pronunciation would be ensured by future generations. The name Tanakh is anacronymof the first Hebrew letter of each of the Masoretic Text’s three traditional subdivisions: Torah(“Teaching”, also known as the Five Books of Moses), Nevi’im(“Prophets”) and Ketuvim (“Writings”)—hence TaNaKh. The Hebrew word mesorah refers to the transmission of a tradition. As the original Torah Scriptures were written without vowels or accents, the Masoretes created a system of precise letter-text, vocalization, and accentuation between the 7th and 10th centuries CE. In recent years, the Dead Sea Scrolls have shown the Masoretic Text to be nearly identical to some of the texts of the Tanakh. Even before the Masoretic Text was the Septuagint (meaning “seventy, the approximate number of translators) the first and most ancient translation of the Old Testament, made into popular Greek before the Christian Era. Ptolemy IIPhiladelphus, King of Egypt from 287-47 BCE, had a magnificent library; he sent his librarian to Jerusalem to get a copy of their Law and the librarian returned with 72 learned Israelites (6 from each tribe). They proceeded—in 72 days—to translate their laws into Greek for the King’s library. This became the official text in the Greek Orthodox Church, the Latin Church, the Russian Orthodox Church, the Coptic Church, the Ethiopic Church, the Armenian Church, and the Slavonic Church. Early Christians relied on the Septuagint translation for most of their understanding of the Old Testament, as did the writers of the New Testament. There have been only three political states in 3,000 years in Israel—and all have been Jewish. The first was established after the Exodus from Egypt; the second during the period of the Second Temple, from 516BCE until 70 CE, when the Romans destroyed Jerusalem; the third is the State of Israel today, established May 14th, 1948.